BOONE COUNTY, Ky. -- Nearly $70 million in federal grant money will soon find its way to Boone County, for improvements to aging interstate interchanges, the Kentucky Transportation Cabinet announced Friday. But it will also mean up to two years of construction along Interstate 71/75. 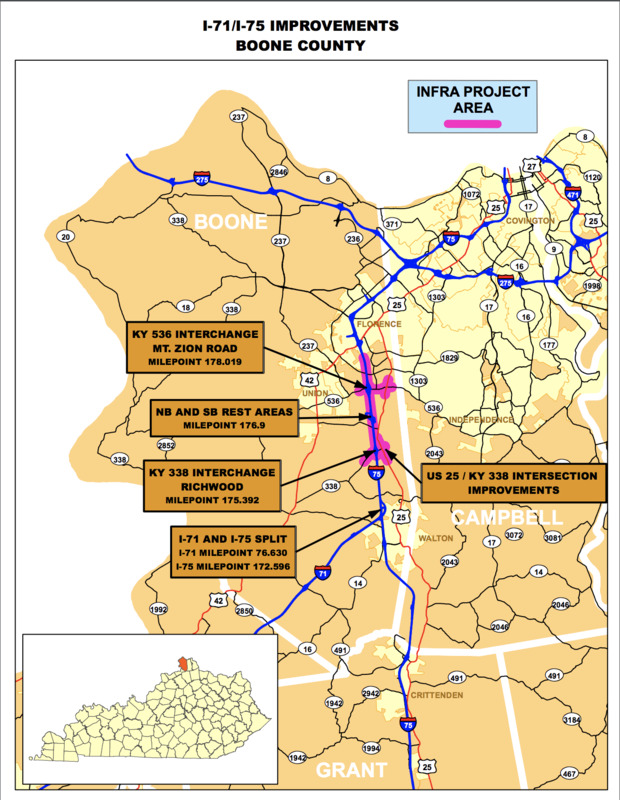 "This award for major reconstruction of these two I-75/71 interchanges and additional interstate lanes in Boone County will have a tremendously favorable impact on traffic congestion, safety and the movement of goods and services along this corridor," said Boone County Judge/Executive Gary Moore, in a press release. The $67.5 million will come in the form of an Infrastructure for Rebuilding America grant from the U.S. Department of Transportation. The INFRA grant will go toward the project's $150 million total price tag, matched by state, local and private dollars. Senate Majority Leader Mitch McConnell quickly threw his support behind the proposed improvements: "Once this project is completed, the improved interstate will better serve the entire region," he said in a press release -- pointing specifically to the project's close proximity to the Greater Cincinnati/Northern Kentucky International Airport. Officials expect construction to begin in 2019, and to complete in winter 2021.